It’s a horse race deemed the richest ‘two mile’ handicap in the world for two dozen 3-year-old thoroughbreds over 3.2km. A race that literally stops a nation. 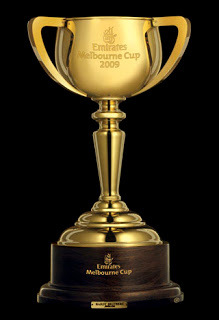 The Melbourne Cup. The Melbourne Cup Carnival runs over a week in November each year and comprises 4 race days – Derby Day (Sat), Melbourne Cup Day (Tue), Oaks Day (Thu) and Stakes Day (Sat) – at Flemington Racecourse in Melbourne’s northern suburbs. It forms the centrepiece of the Spring Racing Carnival, filling the state of Victoria with prime equine specimens and department stores with hats and headpieces as far as the eye can see. The first Tuesday in November (this year falling on November 6th) holds a special place in Aussie hearts. Melburnians get a day off and the entire nation – well the majority who are not at the course itself – manages its day around being in front of a telly at 3pm. There are BBQs, office ‘sweeps’ and much discussion around water coolers, coffee machines or over the bar about the chances of the 24 runners – yes, everyone’s a tipster on Melbourne Cup Day. And there are a myriad of opportunities to ‘put your money where your mouth is’. Being at the race itself is an extraordinary experience (I’ve been 3 times, twice in the posh corporate bit). Melbourne Cup Day often begins with a champagne breakfast in your Cup Day finery in the Racecourse Car Park. For some it’s an opportunity to dust off your headwear, don your gladrags and totter down to the mounting yard. For others, it’s an opportunity to dress down and enjoy the atmosphere. Picnics abound and the bookies are kept busy particularly leading up to the big race. Melbourne Cup punters – celebrating a win perhaps? As the horses and their riders make their way around the mounting yard, down the track and into the starting gate, the excitement is palpable and experts and amateur punters alike jockey for position along the final straight and at the finish line. And as the starter’s orders sound out across the course and the gates snap open, the thundering hooves of 24 of the world’s best are overshadowed by the roar of the crowd. Just over 3 minutes later, the winner crosses the finish line in front of more than 100,000 screaming punters. It is, quite simply, electric. This year’s field, confirmed after today’s Victoria Derby, features both the home-grown and the foreign and with a purse of $6.2million up for grabs, only time will tell whether current favourites and past winners Americain (2010) or Dunaden (2011) can join the exalted ranks of multiple winners. 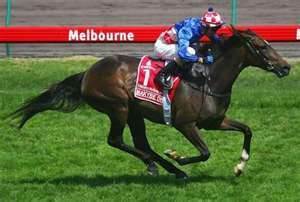 Winners like the prolific Makybe Diva, whose dominance in 2003, 2004 and 2005 remains unmatched, and Archer who won the inaugural race in 1861 then followed it up with another win the following year. And who’s my money on? Well that’d be telling and to be honest, I haven’t really checked out the runners. Suffice to say I’m off to read the form guide. After all, you can take the girl out of Melbourne but you can’t take Melbourne out of the girl. This post also forms part of the November edition of Post Of The Month Club. This entry was posted in Australian Abroad, Expat moments, Melbourne and tagged Australia, Flemington, horse racing, Melbourne, Melbourne Cup by Kym Hamer. Bookmark the permalink. Linda, I think it is human nature to make an event out of these things…brings about a whole new sense of community, mint julep or no mint julep! As for the science of backing a winner, the best wins for me have been wild and flippant punts on names I like…Maluckyday is having words with my punting soul at the moment! It's like the American Kentucky Derby, only with more of a national twist. We lived in upstate New York yet my mother loved getting everyone together around the television on the requisite late Saturday afternoon in May. We all picked horses based on their attractiveness, favorite colors, good odds or cute name; no Mint Juleps, though.